TPC Overall Rank: #341 out of 2933 rides. User Tracker Count: 492 times. Very good pretty realistic ride things falling every where and stuff keeps you interested. The room with the tvs when your waiting is pretty cool. The ride is good to. The fires and stuff and the oil tanker falling all of those are pretty cool. This ride freaked me out! I was pretty young so i get really scared. all i remember was that things are falling all over and a car falls through the roof and water rushes in....very realistic! Fun ride. The show is cool and helps knowing how a movie is really made. The ride part is fun and sorta scary. Nice job. Great ride still gets the heart racing after the 10th ride. Unlike the pre-show which starts to drag after the 3rd. As a first time rider on this attraction, I thought that it was good, but I can understand those who have ridden it a few times, giving it a lower rating. The ride part isnt in very good shape and could use a rehab. The earthquake scene has a bit of everything. Some shaking, water, and fire effects. I could definitely see people complaining who have seen the pre-show section a number of times, but just want to enjoy the earthquake part. The queue was long, the preshow is extremely boring and the actual ride is way too short. I only recommend doing this if the wait time is less than 5 or 10 minutes. The actual ride part is awesome... but I wish you could skip the outdated pre-shows that dont tell anything most people dont already know, unless theyre completely oblivious as to how special effects are done. Earthquake is a decent show/ride. Its quite long, which is cool the first few times you ride it, but after that, it seems to take too much time that you could be riding other things, or so it seems to me. The first room you go into explains some about weather special effects in the movies. You then enter another room where they demonstrate some of the effects used in the movie Earthquake, and then another room where they use some volunteers to perform various functions (my sister has actually gotten picked before). The high point of the ride then comes when you get to experience something like they did in the movie Earthquake. I wont give all the elements away, but suffice it to say that you ride in a subway train and are then subjected to a number of hazardous conditions, including water, fire, and plenty of rocking and rolling. The actual ride part is better than a 7, but the preshows, which become a bit long after youve seen them several times, bring the ride down a bit. Still, not bad for families (less intense than Twister, in my opinion), and thrill seekers should at least hit it up once in order to experience the final part of the ride and learn a bit about movie special effects in the process. This ride is all about having the right seat. If your are stuck in one of the sections that have very little action going on, then you probably do hate it. I encourage being in the second car on the left side of that car. I dont want to give to much away, but there are great water effects, subway crashes, and objects falling from the sky. I have rode it several times, and I will agree with others, that it really is only fun the first time when you dont know what is going to happen. After that is is just more fun to watch others faces on how they react the the chaos. 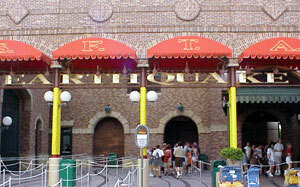 This isnt really a ride, but more a special effects tour. Its not too exciting and can be A LOT better for such a theme. I expected to be riding a trolly though a Californian city (sorry I forgot the name, never actually saw the movie) while an earthquake happened and you tried to make it through while things crashed all around and into you and you try to get through fires from the ruble and fire hydrants spraying their water. But it wasnt. You go through 3 rooms that are a special effects tour. You go on the trolley and you go back to another station where an earthquake occurs and water randomly rushes in, things fall over out of nowhere, and a car crashes through the ceiling. You just sit there and watch it all happen. If the wait is more than 45 minutes, dont bother.